One of the winning teams of a NASA competition to make a full-scale Mars habitat using modeling software, Team SEArch+/Apis Cor, designed this Martian abode, which is built from the upper part of a Hercules Single-Stage Reusable Vehicle. 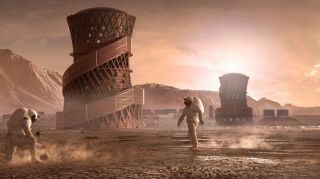 NASA picked three teams to share a $100,000 prize from a competition to make virtual Martian habitats. The 11 participating groups were tasked with making a full-scale habitat using modeling software, building on an earlier stage of the competition that required partial virtual modeling. The teams were graded on their layout, programming, use of interior space, and their habitat’s ability to be scaled to full size for construction, according to a NASA statement announcing the winners. The groups also received points for their aesthetic representation and realism. SEArch+/Apis Cor – New York City – Awarded $33,954.11: This model would use the upper part of a Hercules Single-Stage Reusable Vehicle for a habitat, with the rest of the module 3D-printed and constructed on site by rovers. The design included an inward-facing arch, which is useful for maintaining air pressure on Mars because there is more pressure on the inside of the arch (where the astronauts live and work) than on the outside of it. The collaborators say their design will resist the forces of air pressure similar to the way that a dam holds back the force of water. The habitat includes three independent zones that can be sealed off in case of an emergency. The crew could also evacuate quickly from any of the three levels of the structure by using an exterior staircase. Inside the habitat are two laboratories, four bedrooms, a greenhouse, a relaxation area, and areas to support rovers and spacewalks, among other things. Team Zopherus – Rogers, Arkansas – Awarded $33,422.01:This is a design inspired by biology, with various pods for crew habitation. A landing module would become the base habitat by dropping to the ground and forming a seal, which would allow a pressurized environment for printing. From there, rovers would pick up Martian regolith (soil) and bring it back to the habitat to create aggregate cement, made up of Martian carbonates and water. This mixture would be combined with highly recyclable thermal plastic to create habitat walls. Because concrete can fracture during Martian temperature swings, the outer surface has a shading system (oriented towards the sun) to shield portions of the shell from the sun’s heat, reducing the incidence of cracks. The habitat includes a communal unit with a suit airlock, hydroponic gardens, four bedrooms for crew, a laboratory module, and rover hatches — and can be expanded as needed to meet the demands of research and crew. Mars Incubator – New Haven, Connecticut – Awarded $32,623.88: This multi-modular shape would be built from the ground up. The external supports for the modules are made out of regolith and polyethylene plastic laced with basalt fiber, and the entire structure is resistant to radiation. The modules include a vestibule for suits and rover deployments, a multi-purpose module, a bio-generation module for plant growth, and a primary module that includes a lab space, a food preparation area, and crew accommodations. Each module is connected with bridges that allow crew members to move from place to place without going outside. Winning first place in the Phase 3: Level 4 software modeling stage of NASA’s 3D-Printed Habitat Challenge, Team SEArch+/Apis Cor presented a uniquely shaped habitat with constant support across the structure and many openings for natural light to shine through. In the Phase 3: Level 4 software modeling stage of NASA’s 3D-Printed Habitat Challenge, Team Zopherus took home second place. The team presented a design created by a roving, autonomous printer moving from site to site after completing a structure. In NASA’s 3D-Printed Habitat Challenge, Team Mars Incubator garnered third place with their design by a group of engineers and artists. The competition’s final phase will happen between May 1 and May 4, 2019, when participating teams will present their structural print (which is smaller than the real thing, but still to scale) and compete for an $800,000 prize. The overall goal of the 3D-Printed Habitat Challenge is to make shelters that could be used on the moon, Mars or other locations using local resources at these sites. NASA officials said in the statement that the solutions offered could also be used on Earth, making construction costs lower (among other benefits).